« Brittany Maynard and Lauren Hill. Same direction… two very different paths… Live it or Leave it? Jogging or Running… doesn’t matter! It’s about the GO! Running had never been of interest to me. It was too hard! I felt clumsy and awkward. I never felt light and free. Running was difficult! I couldn’t run the distance from one telephone pole to another without feeling like my lungs would explode. I couldn’t regulate my breath and I was embarrassed that someone might actually see me trying to run and failing miserably! 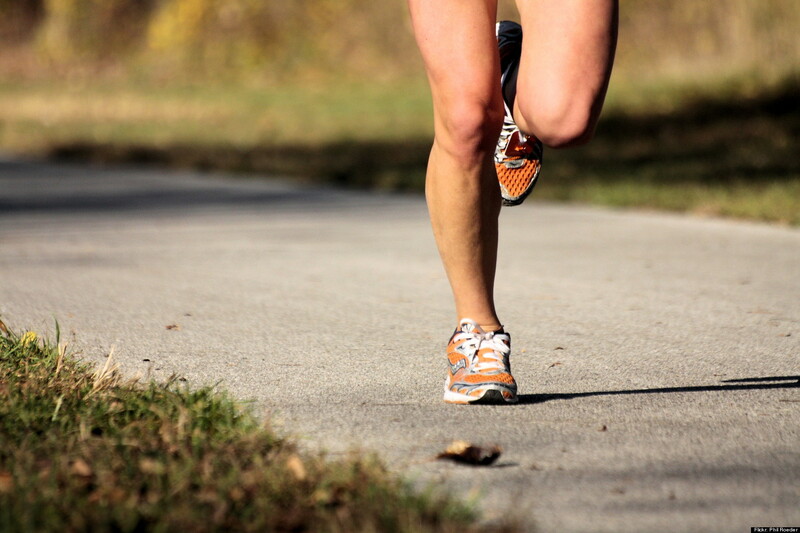 It seemed that running was so easy for others I didn’t understand why it was so difficult for me. I could run short distances. I played softball and had no trouble running to base. Having said that, I acknowledge I was okay to run to the base but I was well aware I wasn’t very fast doing it. My answer to that? Hit the ball hard and send it flying far enough that I could actually get to base. Hey!! It worked! I loved sports so I was willing to find a way to make the running tolerable. While in college, our volleyball team frequently did distance runs up to 3 miles. I was such an awkward teen I didn’t share my feelings of awkwardness, or my fears of distance runs with my teammates. They didn’t know how hard my heart pounded in my chest. They didn’t know how frightened I was that I could literally die before we got back to the gym. My coach had no idea how I struggled to breathe. I kept it all to myself. And I struggled! In hindsight, I am absolutely positive every one of them would have supported me and cheered me to success. However, I continued to keep my struggle and my dislike of distance running to myself. All through my adulthood I continued to enjoy sports and being active. I loved step-aerobics, dance, ballet, and yoga. I became certified in Pilates and I loved teaching mat classes. I have the most fun with Zumba! P90X and other programs become fun for me. When I saw my sister-in-law, Mary, was fast walking a half marathon, I told her that sounded like fun and I’d like to do it with her. 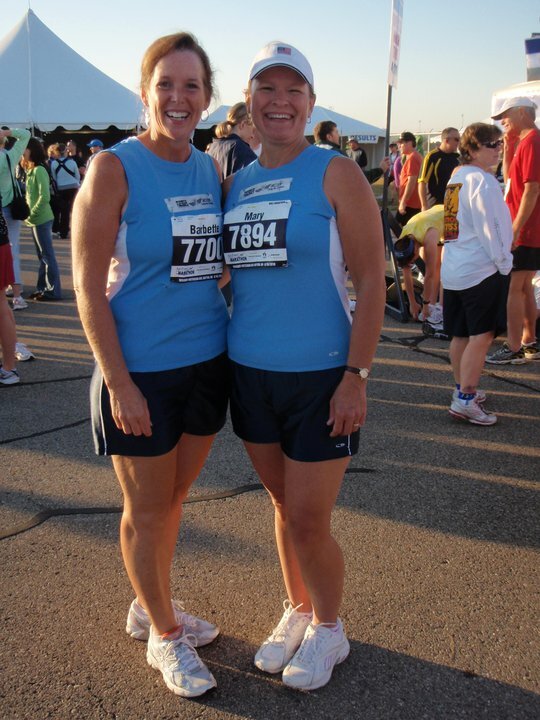 The following year, September 2010, she and I trained for and fast walked the US Air Force Half Marathon. I loved the training walks. We did many of them together but we also had to do much of our training alone. We live over 10 miles apart so we kept track of each other and kept up the same pace, the same distances and took our training very seriously. She would keep an eye on the time and pace of our training walks. At times we walked so fast, I wanted to break into a jog. I resisted because I remembered. Besides, I was 49 years old. No one starts jogging at 49, right? One morning that summer, while on a 4 mile walk by myself, I was pushed for time. I was walking so fast I couldn’t resist the urge to jog. I jogged about 20 yards and I immediately regretted it. My heart was pounding out of my chest, there was throbbing in my ears, my lungs were burning and I was hoping no one noticed! I slowed to a fast walk again. Soon, I thought I would try it again. No better feeling. No better outcome. Ugh! I was listening to my iPod and I laughed out loud when I realized I hadn’t made it through one verse of the playing song. But… to my credit, I continued to try. All summer I worked at it. My goal was to get farther each attempt. I later learned those are called intervals. Sometimes I would set a landmark goal ahead, like a tree or a driveway, and attempt to reach it. Other times, I would plan to get to the end of the current song. Eventually, I was able to sustain a slow, comfortable jog for more than 20 yards! Then, I set my sights on jogging the length of our driveway. Then, it was to the end of the driveway AND back. My next big goal was to jog from beginning to end of a song. I eventually did it. I was so excited!! By the end of summer, I could jog to the road and back 10 times! I had no idea how long it was. It didn’t matter. I was learning to control my breathing, and jog longer distances. Together, Mary and I fast walked about 14 min miles. My slow jog was probably 13 min miles. I didn’t care. I could finally jog without fear of exploding lungs! The funny part was I started to enjoy it. We worked hard for this! We rocked it!